The kitchen is the heart and soul of the home. It is the place where everyone gathers regardless of the occasion. Most have realized that, even more than the living room, the kitchen is where much of the “living” actually takes place. So it comes as no surprise that kitchen-related gifts are welcome as they bring enjoyment year round. This year, we have assembled a RainyDayKitchen tested group of kitchen gear which we have found to be useful, high quality, and well-made. Whether it is making espresso, cutting vegetables, or serving appetizers, the items we are recommending make the task easier, quicker, and/or more enjoyable. Espresso Machines: An espresso machine is a device that brews coffee by forcing pressurized water near its boiling point through a “puck” of ground coffee and a filter in order to produce a thick, concentrated drink called espresso. Handpresso Car: A revolutionary machine that prepares a premium quality espresso in the car! Handpresso Auto helps you optimize your coffee break wherever you are. Simple and easy to use, Handpresso Auto can be placed in the cup holder. Just plug the espresso machine into the 12V cigarette lighter, add water and an E.S.E. coffee pod of your choice. Then press the button, wait for the 3 beeps and the espresso is ready! Handpresso Wild: Able to generate a 16-bar pressure as with a bicycle pump, the Handpresso Wild Hybrid only needs hot water and an espresso coffee (ground coffee or E.S.E. pods) to make a high-quality espresso. Light and durable, the device can be stored easily in a drawer, backpack or with camping gear. Handpresso Outdoor Kit: The Outdoor set includes everything needed. Simply add hot water and your favorite ground coffee or E.S.E pod to brew a great espresso. ROK Manual Espresso Maker: By using hand-powered pressure, coffee-making becomes a more involving pleasure. As you become more experienced you can fine-tune how you use the ROK espresso maker to produce espressos to your personal taste. Made from engine-grade metal. If a metal part fails within 10 years, it will be replaced for free. Handpresso Accessories: Handpresso offers a whole range of products to complete the outdoor, on-the-go espresso ritual. Made by a French company that styles itself as the founder of the nomadic espresso, Handpresso represents the future of the espresso culture. A coffee experience that knows no boundaries – great espresso at home, on the mountaintop or in the car. Domepod Tamper: The Handpresso Domepod Tamper is the only tamper designed to work with Handpresso’s Domepod and Wild Hybrid espresso machines. Made of one-piece aluminum and weighing little more than half a pound, the tamper is as rugged and portable as the Handpresso themselves. Domepod Coffee case: Take your favorite coffee on the road with the Handpresso Domepod Case. A mess-free, portable coffee solution, it has three compartments, which can be filled with ground espresso. Thermos Flask: Durable and travel friendly, the Handpresso Thermos Flask can keep its contents hot for up to three hours. This unique thermos features a thermometer with visual indicators built right into the lid for easy and accurate reference. 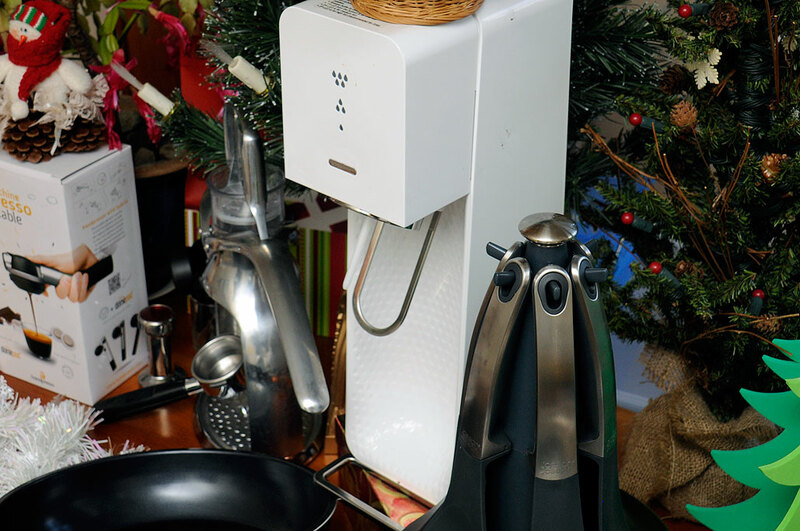 SodaStream SOURCE: The elegantly redesigned carbonating bottle easily locks into place with a single-push motion. Powered by a CO2 canister, the refined mechanics of SodaStream Source make the entire top surface responsive to touch, and the strength of carbonation is visible through an LED display, providing instant, visual feedback. We have had most of the SodaSteam carbonators available and this is the best unit we have used to date. 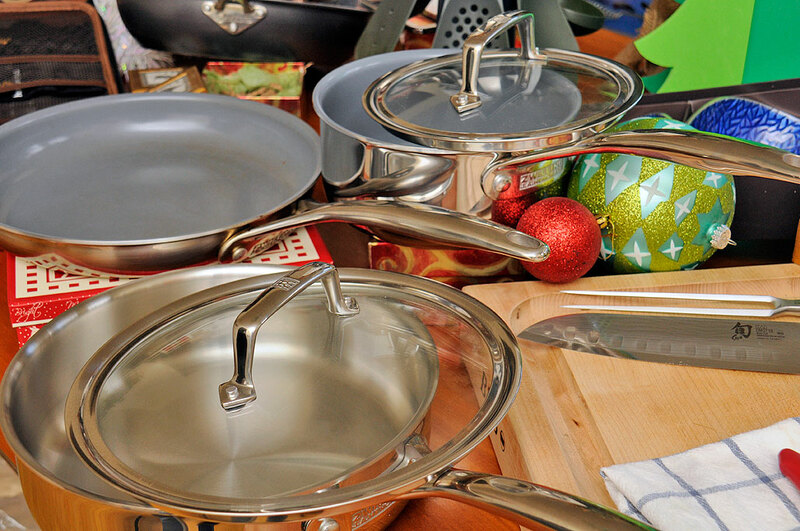 Ceramic Cookware: Ceramic cookware is a metal pan, typically aluminum, coated with a layer of nano-particle ceramic. The ceramic surface, which seems really smooth, is actually rough down at the micro level which causes solutions to bead up more and not stick to the surface. Kyocera 10″ Ceramic Frying Pan: A beautiful high-performance nonstick fry pan that features Kyocera’s proprietary ceramic nonstick coating technology that has been shown to outperform and outlast other leading brands. The heavy gauge aluminum base clad with a stainless base provides excellent thermal conductivity resulting in quick and even heat distribution. The durable riveted stainless handle is comfortable in the hand and enables the pan to be oven-safe up to 400° F.
Zwilling Energy Frying Pan and Sauce Pan: Zwilling Energy cookware features fully clad, 3-ply stainless steel construction with a thick aluminum core to conduct heat quickly and evenly, plus a PTFE and PFOA free Ceraforce™ nonstick ceramic coating for effortless food release and cleanup. Zwilling Stainless Steel Cookware: Zwilling J.A. Henckels, manufacturer and distributor of Truclad Cookware, is recognized globally for the highest possible quality and function. TruClad Cookware features technologically advanced SIGMA Clad 3-ply construction that’s 3mm thick. Its three-layer construction ensures quick and even heating, not just on the bottom of the pan, but up the sides, as well. The brightly polished magnetic stainless steel exterior is safe for all types of stovetop burners – gas, electric, ceramic, halogen, and induction. The 18/10 stainless steel interior, which is the most corrosion-resistant type of stainless steel, ages beautifully and won’t react to acidic foods. It’s even safe for use with all types of utensils, including metal. Joseph Joseph Elevate 100: The Elevate range of kitchen tools is designed to improve hygiene and minimize the mess made by placing utensils onto kitchen surfaces during use. Each tool has an innovative weighted handle with an integrated tool rest, ensuring that, when an Elevate utensil is placed down, its head is always raised off of the work surface. Perfect for use with non-stick cookware, their nylon heads are heat-resistant up to 200ºC/392ºF. The Elevate 100 Carousel Set comprises 6 essential kitchen tools and a specially designed rotating storage stand with a non-slip rubber base. Kyocera 5″ Slicing Knife: This all-purpose knife is perfect for thin, clean cuts. Ideal for fruits, vegetables and boneless meats. We use this knife daily and is one of our favorite in the RainyDayKitchen. Shun 7″ Santoku: A santoku is a Japanese all-purpose kitchen knife. Like a chef’s knife, the santoku is used for just about every cutting job in the kitchen. The name means “three virtues” referring to the three types of foods it can be used to cut (vegetables, poultry, fish) or for the three types of cuts themselves (slicing, dicing, chopping). The hollow-ground indentations on the blade helps it glide through the food more easily. If we had to choose to own just one knife, this would be the one. Shun Carving Fork: The Shun Classic Carving Fork acts as an extension of the carver’s arm, holding the meat in place while the knife glides through. The long tines of this carving fork are designed to penetrate large or small roasts with ease. Also, it can be used to “anchor” meats to the cutting board, making cutting safer. 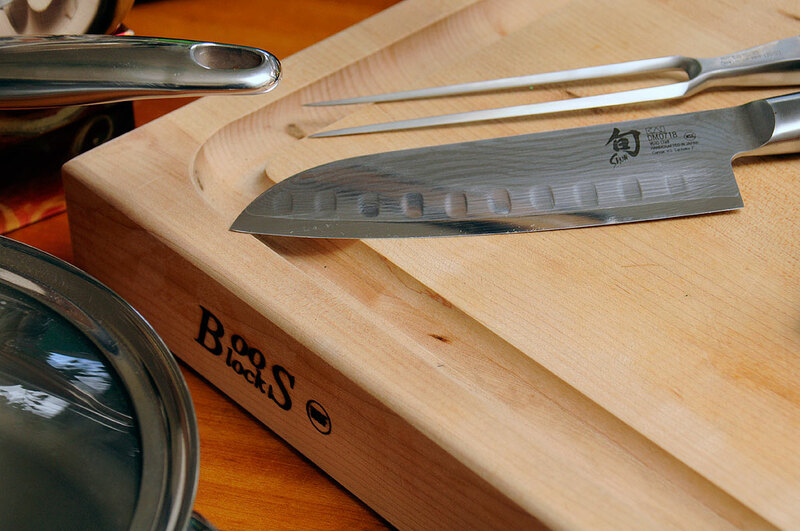 Edge-grain reversible Boos Cutting Board: Good knives should be paired with good cutting boards. We prefer hardwood surfaces for cutting because they are easier on the edge of the knife. We like edge-grain cutting boards because they offer a uniform thickness and true flat cutting surface. We recommend John Boos cutting boards because they are crafted from quality hardwood with features that are both well thought out and finely executed. Serving Bowls and Tray: A beautiful presentation enhances not only the table setting, but also the taste of the food on the table. If you are looking for something different, check out the offerings from Simplydesignz. 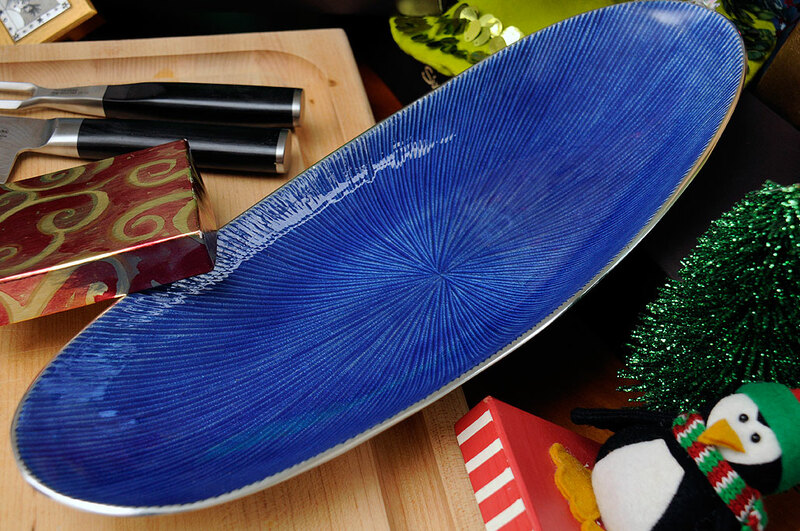 We are partial to the Parisian Blue bowlsand tray, but they have lots of other colors and “designz” to meet a wide variety of tastes.